Although the ride is still not open, today Knoebel’s fans and coaster fanatics got a glimpse of the Flying Turns roller coaster. 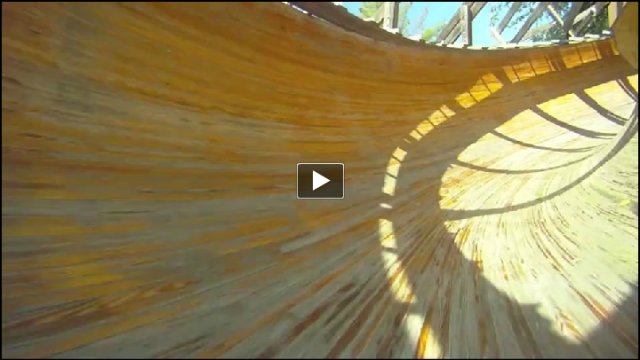 The park released a POV video of a GoPro camera mounted on one of the coaster’s chasis going down the track. From first glance, I have to say I am very impressed with the speed and pacing of the ride. Flying Turns, which is now approaching it’s 4th year in delay, is custom designed and built by the Knoebel’s theme park. Inspired by the “flying turns” style coasters of the early-mid 1900’s. The ride which was constructed in 2006 with a planned opening of 2007, obviously, missed that planned opening date. Knoebels, who is constructing the ride themselves, has gone through a fully of changes, at one point radically changing the layout and also burning through a seemingly endless list of chasis mock ups. This latest update does however seem optimistic. The track appears to be no problem with the park now only having to tweak the ride’s trains before opening. When will the ride open? “When it’s done.” The park has said that it is very unlikely that the ride will open this season, but you never know. Leave a comment with your Park Thoughts below. I have gone to Knoebels almost every year since they started construction, and I’m glad that they FINALLY plan to open this thing. I was surprised by the speed of this thing, it looks like it wants to flip going around some of those turns! They never planned not to open it. But when you are building a ride from scratch with no outside help, obviously you are going to run into some bumps. And I do believe the speed is the problem. The video was recorded by a camera mounted directly onto the chasis. Imagine if the seats and riders were added. The added weight may cause the ride to go even faster! Wow, I didn’t even think of that 😀 This thing could be seriously intense! unless they had dummies in the trains when they filmed this thing. It was cool seeing this built though, because this is the only ride I’ve really followed throughout its entire construction, I even got to walk the track once!